A journey is not measured by what I have done or seen, but rather by the lessons or insights I have gained. This also applies to my pilgrimage to the congress. It is not so important as to what exactly happened and what I have done or seen, but what it is that came across as an individual message or lesson. What follows is not an attempt to tell accurately what happened during the 3rd Oblate World congress but what questions and experiences I am left with and the attempt to share them. It was a great privilege to serve as the UK national coordinator for the 3rd World Oblate congress. 13 UK delegates representing Oblates from Prinknash, Pluscarden, St Augustine, West Malling, Ealing, Elmore/Salisbury and Douai first had a get together at Ealing Abbey in June to then meet again at the Salesianum at the outskirts of Rome from the 4th to 10th of October 2013. The motto of the congress was: Obsculta, the Oblate listening in the world. The programme included, meditation, Lauds, Vespers, the Eucharist, Compline, presentations, workshops, shared meals, trips to Rome, for a public papal audience and a visit to St Anselmo, a trip to Subiaco and Monte Cassino. Above all the congress was an encounter and an experience of the Benedictine charism in action. The congress was indeed a pilgrimage and it is fair to say that I felt stretched to my limits and sometimes beyond,….. physically, mentally and spiritually. One hallmark experience was the privilege to meet Oblates from around the world; from Argentina to Australia and from Canada to Korea. Every single Oblate inspired and formed by the Rule of St Benedict manifesting his or her particular monastery in a particular cultural context. Though true to the Rule, the diversity could not be greater. The formation and prayer practice ranged from Tridentine liturgy to silent meditation. Most Oblates belonged to a monastery; some belonged to a monastery without walls taking Oblation to further and unknown levels for most of us. “My words are addressed to you especially, whoever you may be, whatever your circumstances , we can read it in the Prologue……As a consequence the Benedictine charism included Catholics and Anglicans or Presbyterians which raised important questions and proved difficult for some. Formed by my own monastery I could see myself stretched in my understanding of what Oblation means when listening to other Oblates with an unequivocal Benedictine formation albeit different from mine. In this way I could see the emergence of the the universal Benedictine charism. These encounters could clearly lead me to a newer, deeper and wider understanding of what Oblation could mean. The garment he receives is from a much older tradition which he adopts and then realises in his own life. I would like to think that in our affiliation to our monasteries with and without walls we gradually and continually receive the monastic garment. The monastic garment – a tradition – will have to be realised in our own lives and may differ from the ones who are handing down the tradition to me to us. The duty to preserve, live and develop this monastic tradition in our various cultural and individual circumstances will be the task of a lifetime of the Oblate. 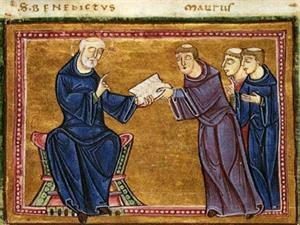 The congress in Rome taught me that as Oblates we have been entrusted with the monastic tradition being handed down over years through our relationships with our monasteries. This monastic garment of course is a symbol of a new creation in Christ. It symbolises the process of letting go of the old (self) and imitating Christ in a self emptying way. Self emptying or Kenosis featured twice during the congress. Firstly in Fr Michael Casey’s landmark talk when he stated that the word of God emptied itself and became text and secondly, it featured in one of the workshops where we explored the possible connection between Kenosis and Oblation. It was suggested that Christ’s self emptying is the Oblates model of self giving. To give one-self ultimately leads to the total giving of one’s self. This self given is emptied of itself. To sum up. The lesson that is coming out from our pilgrimage is that through obsculta – listening, we Oblates receive the monastic garment and are asked to realise it in all its diversity by total self giving – self emptying. My hope is that we accept the call and it’s responsibility. Back row l-r: Jim Bradley (Pluscarden); Pam Morey (member of UKOT/Prinknash); Stephen Day (Prinknash/member of UKOT); Thomas Brunnhuber (National Coordinator/Douai); Klara Brunnhuber (member of UKOT/Douai) Front row l-r: Anne Froud (Malling); Frances Bailess (Spiritual Assistant/Minster); Anne Martin (Ealing); Pam Hendricks (Douai); Jane Roze (Chilworth); Gerry Reilly (Salisbury); Martin Gardner (member of UKOT/Pluscarden). Philip Swindells is not in the picture. Well it’s over! A wonderful week, absolutely full and a little bemusing for those who had not been before. 156 Oblates from 23 countries – a truly memorable occasion . There were two speakers, Sr Mary John Mananzan from the Philippines and Fr Michael Casey from Australia. Sr Mary John spoke on listening with the ear of the heart and Fr Michael on Lectio Divina. We had four workshop periods over the next three days at which we were able to consider in more depth the content of these two talks. What became apparent was that some Oblates were not familiar with Lectio Divina – formation from Monastery to Monastery, from country to country, and from culture to culture, varies tremendously. It would be impossible to produce or even try to encourage a common formation programme – this is all part of the Benedictine ethos – we appreciate and accept that we are all one and yet all not one. It’s arrived – 4th October – some 200 Oblates will be gathering at the Salesianum near Rome for the beginning of their week’s Congress. A detailed report will follow after 10th October but please remember everyone involved in this wonderful occasion in your prayers . On the last Saturday in June ten of the GB delegates spent the day at Ealing Abbey as guests of Fr Timothy Gorham, their Oblate Master. It was a truly wonderful day, enhanced by the sunshine, and we were able to learn more about the Congress at which we are privileged to be representing our monasteries in October. The number of delegates wishing to attend the 3rd National Congress in Rome is not as many as previously – perhaps this is due to the present economic climate? It is an expensive exercise and one which it might be prudent to plan for in the future. A thought – perhaps each monastery, that might consider sending a delegate to the next Congress, could consider setting up a fund amongst its oblates in order to assist towards the cost for next time? l-r: Stephen Day (Prinknash Abbey/Treasurer of UKOT); Gerry Riley (St Benedict’s Priory/member of UKOT); Klara Brunnhuber (Douai Abbey/member of UKOT); Thomas Brunnhuber (Douai Abbey/ National Coordinator); Philip Swindells (St Benedict’s Priory, Elmore Abbey); Anne Froud (St Mary’s Abbey, Malling); Frances Bailess (Minster Abbey/Spiritual Assistant); Jane Roze (St Augustine’s Abbey, Chilworth). 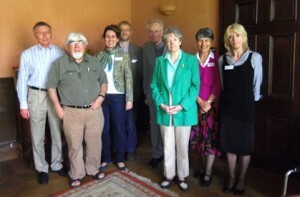 Two other delegates missing from the photograph were Pam Hendricks (Douai Abbey) and Pam Morey (Prinknash Abbey/member of UKOT). 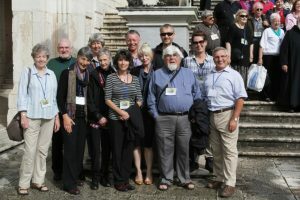 On 3rd January 2013, the Roman Oblate Organising Committee announced that the UK had been allocated 15 places for the 3rd World Congress, with the total number of participants limited to no more than 250. National Coordinator Thomas Brunnhuber followed up with emails and letters to all UK monasteries, asking Oblate Masters/Mistresses to register their interest by 28th February if they wished to send an oblate representative to the Congress.